Time for the carnival. I hope we get a lot of nice posts to showcase. I have a lot of projects coming for this year. And one of the most important is my grape. 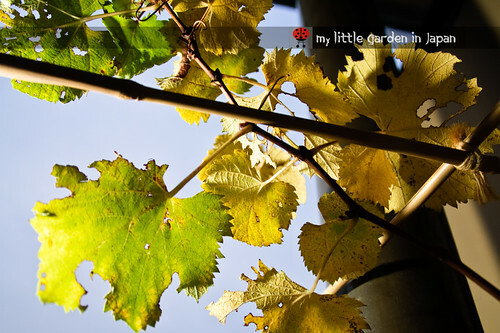 I have always wanted to grow a grapevine in my garden. But, I always thought it would not happen until I got a house for myself. When I started my little garden here I considered buying one for one moment, but then I thought there would be many problems when caring for one in a small balcony and I kept coming up with excuses not to do it. Even when growing on a small container grapevines can spread quite far. And since I don't have a permanent house yet, I didn’t wanted to risk having the grapevine climbing all around a balcony and then having to move and loosing all the effort from that year. But, one day when I was at a library looking at gardening books (And I mean looking because I cant read that much japanese, so I usually only look at the pictures) I saw a very nice photo of a grapevine growing on a small pot, all coiled around itself and with a lot of fruit hanging. The pot could not had been more than 15 cm tall, and the hole plant looked under a meter, but yet it had a lot of fruits. It had never occurred to me that was possible! Back in my country I have always seen it growing big, even when in a small pot. I don’t know why I didn’t thought of it before. I looked around more in the Japanese books and the same layout was in almost all of them. They all explain more of less how to do it. I guess in Mexico we don’t try because we have the space. But here in Japan, where space is a luxury some times, growing mini grapevines is common. That is the good thing about traveling, it helps expand the horizons and think outside our own box. So having no more valid excuses, I got my grapevine. I also got a nice planter and some bamboo sticks to make the frame. The plan is very simple, let only one or two branches grow, keep it coiling around itself and prune a lot to keep it tight. Hopefully next year I will have it set and I will get some nice fruit our of it. The original photo I saw in the japanese book only had one level of "circling", but my planter is quite big so I think I can get away with a "two stories grapevine". Oh and also, some time later I saw them in person. They had a couple in the garden center. I have even seen a bonsai grapevine with some fruit too. That should teach a lesson about thinking out of the box. Now is your turn, What are your gardening plans for this new year? For the blog carnival, please input the link directly to the post you are submiting in the widget below. Just click the blue button that says add your link. Remember it must be a post about what do you plan on doing at your garden this year, maybe about one particular plant you want to have, a renovation you will do, a special patch you will grow, a new gardening technique you will give a try, or any other project you have prepared for this new year. If you have more questions about the carnival or you want to add a link to this page click here to go to our carnival main page. There you will find more information and some resources you can use. Or if you want to see past carnivals click here. Also, add a comment if you like and let us see what your garden is bringing this new year! I'll be posting to your Blog Carnival tomorrow. Hope it goes as well as the last one. Fer, I too keep Rosemary around like you mentioned on your past posting. In fact, the plant is setting right here beside me in the sun room. I have brought it in each Fall and is is great for fresh herb cuttings all Winter long. I was told this would be hard to do. I have had no problems at all! This is the fifth year I have had it in the house for Winter. It is doing great. Blooming like crazy right now. I have re-trimmed it to be more of a "bonsai" style to fit better in my Asian Garden during the Summers. In regard to your tulips coming up, way too cold and lots of snow on the ground here in the Midwest. Spring is still a long way off. A bonsai grapevine! That's a nice idea. I think I must try that this year. I also plan to visit your garden center this year. So many plans, so little time. I hope it is ok that my entry for your carnival is in Dutch. I have a translate button. I've never seen grapes pruned in that way, either! 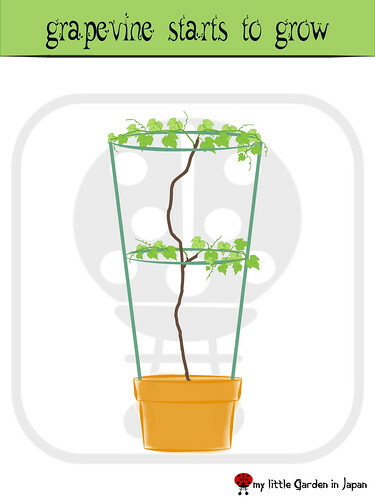 What a cool idea, I bet it would work for other vining plants as well. I actually keep muscadines on the fenceline but I don't have more room for table grapes. Perhaps I could keep some pots on our deck. My boyfriend and I were also puzzling how we could fit hardy kiwi fruits into our scheme since they are so unwieldy. I wish you all the luck on your grapevine project. May you harvest the fruits of your labor soon. Keep us posted. Hi Fer, Just added my post for the new year's resolution carnival. Hope I haven't over-committed myself! Thanks. Thanks for doing another blog carnival! I absolutely love the grape vine graphics...Wish I was that talented! In Germany it is also quite common to train potted lemon trees that way, though of course they are not vines so the you shoots have to be bend around the supporting frame and tied in. Very nice and cute illustrations! The local nursery i use to go is selling the grapevines like how you wish yours to grow too. 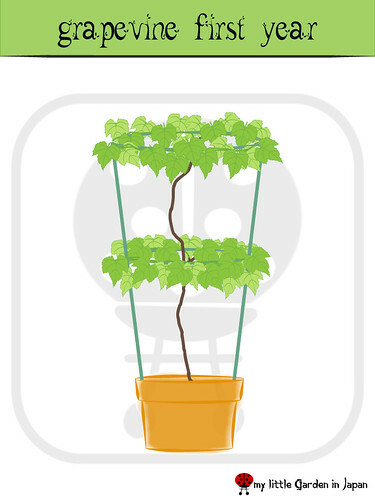 The grapevine may get very bushy later like what i saw in the nursery, so remember to get a strong ring support for your plant. I am tempted to grow grapes when I read about your project. I wonder should I grow grape at one side of my new garden arch. You are very good at drawing very cool template you have there. Thank you for hosting this carnival. Very nice drawings and an interesting concept.You will need a good support for it as it matures and gets laden with fruit. Thats a good idea to grow grapes in pots, I have seen our local gardeners doing that too and quite successful. The climate in Japan, should have no problem in growing a healthy fruiting grapes. Your graphics are so cool, I love it! I've never seen a grape vine grown this way so I'll be interested to watch how you progress with it. Hope you get lots of fruit for your efforts. Hi fer, what a clever idea, though I'm afraid I lack the patience for that kind of gardening. My project for this year is the allotment, so my contribution to the carnival is my latest post about my mission to get it ready for planting in Spring. I had to add our own grape vine on top of my renovation project post .. it just made me smile with how many of us love to have grape vines in our "gardens" ! Thank you fer for having the World Garden Carnival. I have linked my Frozen in Time post for looking to practice better water usage in my tiny garden. Noting new to be planted as my garden is so small, but hope this will be a big improvement as I am saving snow now in barrels. Takes a lot of snow to make water although it varies by type and consistency of snow for how much and how quickly. Lots of nutrients in snow, but some impurities too are caprtured on the way down. For quantities, some have a 9:1 ratio, others are 30 inches snow equals 1 inch water. I know I keep piling it in. It does not stay frozen in the garage. I should have kept a record, but too late. Fer, as usual I'm greatly impressed by how much you accomplish in so little space. Who would have thought you could grow grapes out of a pot! I look forward to seeing photos of your new vine. Thanks for starting up the World Garden Carnival. Sounds like you have a great plan with the grapes. Also, I love the badge on your left sidebar...very cute!! 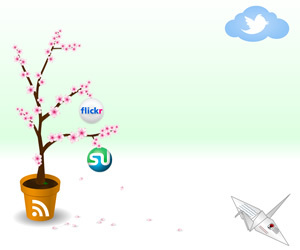 I'm working on a post and will link it to your site. Fer, great idea and I think I may play. You may be surprised but then I am a gardener of a different color. I keep being impressed by your tiny space but large garden approach. Before you know it, you'll be cultivating an orchard. Nice carnival. The grapevine idea is interesting, I just learned a little something about high density home orchards, seems like this could fit in with that idea. Thank you very much! So many great inputs so far. And thank you to all the new people who has join us too. Is always great to meet new friends. Mark ~ thank you very much for the link! Denise ~ no problem, we are world garden, all countries and languages are more than welcome. Thanks for hosting this blog carnival! It was a great motivation to me to actually finish one of my gardening resolutions..to plot my gardens. It's also fun to see what other gardeners are planning for the next year. Your art-work is so beautiful and creative-thanks for sharing! Hi Fer, I just added my Carnival post! I love to make plans, so it was the right thing for me! Bonsai grapevine is sure interesting plant to start the year. I would love to see the fruits it would bear. Just recently I've been thinking a challenging plan to raise & organize an orchid system in my garden. Huh, tough challenge for me. Hi Fer, Great descriptions on growing grapes in a pot. I have a grape plant in a pot but it doesn't look anything like your beautiful picture. Fer, I love your description of the evolution of your grape vine idea. Sometimes when we can't do exactly what we want, we do something better. Thanks for sharing your journey. Now I can't wait to visit the carnival. I have just added my post. Thanks! Fer, I made a New Year Resolution to read every post in your blog carnival and comment. I just finished and found some great new blogs. Thanks for organizing it. I've left you an award on my blog. Don't feel under any pressure to accept it if you don't wish to do so, I just wanted to let you know that I enjoy reading your blog. Wonderful Carnival Fer! Good luck with your grape project! I look forward to an update. Hello, I found your blog and this carnival through A Garden Spot. Great idea so I linked up too! Love your Grape Vine project! I'm really looking forward to seeing how the grape vine does in the container. I tried growing one once without realizing just how giant that one would get. It took over everything. The thought of being able to grow one in a container is exciting. I'm going to add my post from a few days ago to the carnival, it's about my plan for our front garden. 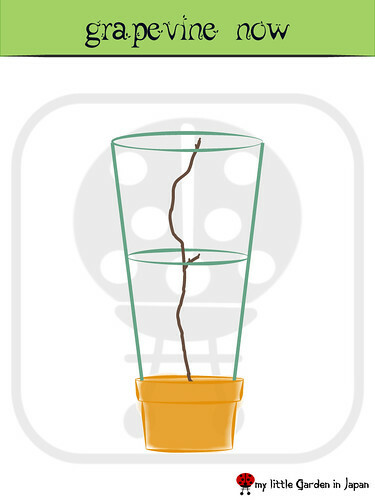 I think the Grapevine experiment will be fun for you to try. When living in Germany with only a Balcony to call a garden I learned to compromise with flowers and veggies. I also discovered Apples grown in such a manner as you plan your grapes. I never tried it but saw this process in a small garden near by my apartment. It was interesting to watch the progress of the apples on such small trees. Good Luck with your grapes! I hope you succeed. It would look good. What a great post and carnival ride! I have lots of wild grapes growing on my property and I have to trim them back on the house or I think they will grow over the entire roof! But they are so easy and I just love their leaves. It takes me ten minutes to tame them. Birds love them. Looks like you had a great response to your blog carnival. I am sorry I could not participate as time would not allow. I have a huge concord grape plant in my yard. Hopefully, your plans will work with some hard pruning. Hi, Fer, wonderful plan for your grapevine! I think it will be beautiful, and I hope it will also be quite productive. The Carnival is a lot of fun, though I haven't had time to fully participate by posting my own plans. But I have enjoyed reading about what other gardeners are up to. Great projects! Thank you! The carnival was a success! Enjoyed my visit to your garden...learning new things from your posts! Sounds like you have a plan with your grapes. Looking forward to updates on that! OK, I got my act together and forced myself to think. It might have turned into a vent, but it was nice to think about what my goals are. No major in-the-garden projects, but goals that I'm happy with nonetheless. Thanks for hosting! I finally have my carnival post up about my garden plans for this year. Thanks for hosting the carnival. I hope you get a minute to stop by and read my post. 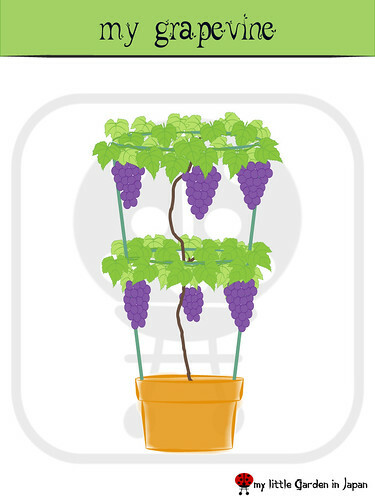 Oooh, that is so cool that you can grow grapevines in a container! My post for your carnival was about adding a new garden pond. It was quite a big job and I was tempted to postpone it, but knowing I had told the world (through your carnival), I just had to do it. Now the pond is done and looking beautiful. Thanks Fer - it may never have happened without your carnival.